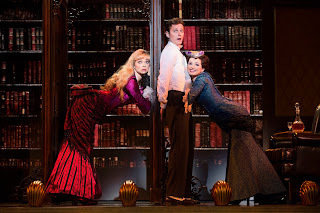 The 2014 Tony winner for best musical is on tour and currently stopping at the State Theatre for one week only! 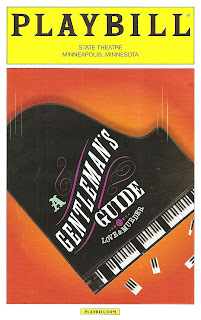 A Gentleman's Guide to Love and Murder is relatively small in scale for a Broadway musical; I counted 11 people in the curtain call, and most of the action takes place on an adorably tiny stage on the stage (which is why it's playing at Hennepin Theatre Trust's medium-sized theater*). But despite its size it packs plenty of punch. This story of a poor young man 8th in line for the Earldom is tight, clever, funny, outrageous, and loads of fun! If you like your musical comedy broad and British, this is the show for you. The likeable English everyman Monty Navarro discovers upon his mother's death that he's an heir to the very wealthy D'Ysquith family. The only problem is there are eight people in the royal line ahead of him. He tries to make nice with the family, but they disowned his mother when she married his father and refuse to acknowledge him. He gently helps along the demise of the other heirs, which is to say he murders them, but somehow in a sweet and unassuming way that leaves you rooting for him. He's also torn between two women. 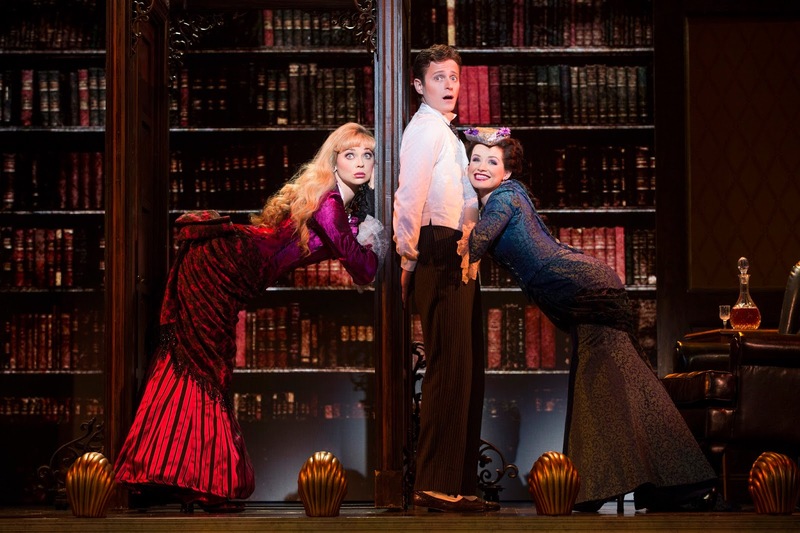 Monty and Sibella seem well-matched, but she marries for money. Monty then meets and falls for Pheobe, his cousin or something (but they're English royalty so that's a plus!). Both women support him as he goes on trial, and he manages to evade the law as he writes the titular guide. Perhaps part of the reason murderous Monty is so easy to root for is the charming performance of Kevin Massey (fun fact: Kevin originated the role of Almanzo in the Little House on the Prairie musical, which premiered at the Guthrie in 2008). His innocent and surprised expression is priceless as he often turns to the audience in solidarity, easily winning us to his side. And he sings like a dream! The clever set design (by Alexander Dodge) of stage-on-a-stage is cute and interesting, quickly changing from one scene to the next with the aid of video projections. But I'm surprised there's any scenery left at the end with the way John Rapson chews on it throughout the show! He plays nine members of the D'Ysquith family, and each one is quite the extreme character. He's a delight to watch in the exaggerated comic expressions. As Monty's two leading ladies, Kristen Beth Williams (Sibella) and Adrienne Eller (Pheobe) are perfection in performance, voice, and look. The show rivals Six Feet Under in the creatively weird way that people die - from being attacked by bees to falling through a hole in the ice. The only thing I knew about this show before seeing it was the performance of "I've Decided To Mary You" that was on the Tonys. And it's even more fun to watch the very physical and intricately choreographed performance of a love trio in person. Peggy Hickey's choreography isn't what we usually think of in musicals, no big dance numbers, but sharp movements that create constantly changing tableaux. The costumes (by Linda Cho) are scrumptious, with many gorgeous corseted gowns for the women, multi-pieced sharp suits for the men, and fast-changing costumes for the D'Ysquiths. Gentleman's Guide continues through this weekend only. *The Hennepin Theatres (Orpheum, State, and Pantages) have new security measures which include bag search and wanding, so allow plenty of time before the show and expect long lines to get into the theater.